This particular title, Living in God's Two Kingdoms, by David VanDrunen, was put out recently by Crossway, and after I spent a few weeks reading and digesting it, Carrie suggested that I share my thoughts with y'all. This book struck at a particularly relevant time for me, as I've been trying to pay more attention to politics and the effects of the recent elections, and at the same time trying to work out an appropriate, scripturally-based attitude for myself toward politics and that aspect of cultural involvement. The "common kingdom" being the fallen world in which we live and operate from day to day, involving our vocation, culture, politics, music, marriage, education, children, hobbies, sports, etc. The "redemptive kingdom" being the spiritual, heavenly bond first established by God through his covenant with Abraham (Gen. 15-17), in which eternal salvation by faith is granted to a particular group of people. In the New Testament, this salvation is extended to Jews and Gentiles alike through Christ's atonement. The redemptive kingdom will one day culminate in the "new heaven and new earth" described in Rev. 21; but, for now, we as Christians are called to live, as it were, with one foot in each kingdom. Christians are referred to in the New Testament as "exiles", or "sojourners", and we know that this current world is not our final home. Similarly, God sustained the Israelites when they were awaiting the Promised Land, and did so again during their captivity in Babylon. Thus, "living in two kingdoms" is nothing new for God's people, and as a result VanDrunen captures quite a few unexpected insights from the Old Testament that are very applicable to our lives today. In the common kingdom, we work hard at our jobs, enjoy our pastimes, take care of the physical needs of our families, submit to our rulers, etc. This aspect of our lives may not appear to be very different from the way some unbelievers conduct themselves. As Christians, should we be worried about this? Should we demand that the way we live our regular lives as Christians always appear different than our non-Christian counterparts? VanDrunen, argues, "No." We shouldn't be using the yardstick of the common kingdom to measure the depth and maturity of our faith as Christians. (Compare this to the Catholic tradition of associating self-denial, and a host of other behaviors, with piety.) For example, a Christian plumber, other than perhaps the "ichthus" sticker on his car, will probably approach his daily tasks just as an unbelieving plumber might. And the world will hold them both to the same expectations — to deal fairly in business, and to keep the pipes from leaking. 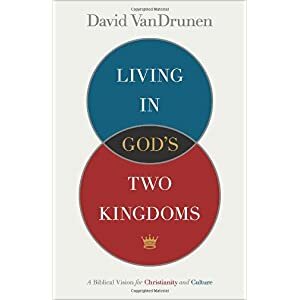 VanDrunen walks through many scriptures, viewing them through this "two-kingdom" lens to bring a sense of context that is refreshingly clear in describing how we, as Christians, should relate to God, to each other, and to the world around us. I've already noticed how this has shaped my thinking in every-day situations, and it has definitely changed the way that I read and understand God's word. This book will definitely force you to think. (Not always a bad thing!) It definitely does require some attention to fully read and absorb (at least, it did for me, but I was not very familiar with many of these subjects.) However, it's written in an approachable style that is rarely dry or academic, and, weighing in at about 200 pages long, its length is manageable. I, for one, am glad to have read it. It sounds like there are shades of Augustine in there. Very interesting. Wow. How can both of you write such solid reviews? Thank you, Jonathan for sharing. The post alone clarified some thinking for me. THis looks like a very good book...one to read.